Here is an illustration of the official "1 inch bend" flexibility test used for commercial junk mail shippers. 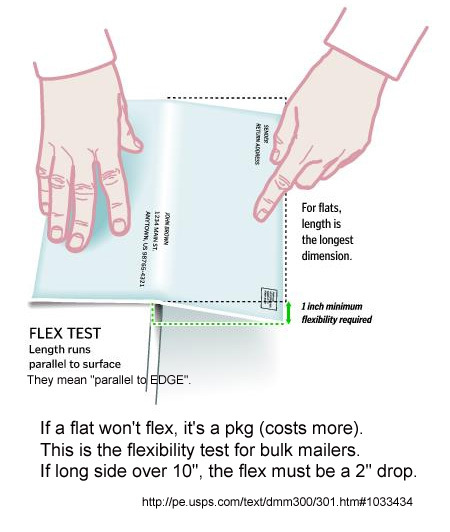 For envelopes longer than ten inches, it has to bend two inches (and flex back). Note that you bend the shorter side. This is the dividing line between a "flat" and a "parcel". IS IT A LETTER -> FLAT -> SMALL PKG ? If you violate a single condition for letters, you are kicked up to flats. Over 6 1/8, over 11 1/2 inches, over 1/4" thick. If you violate a single condition for flats, you are kicked up to small parcels. Over 12", over 15", over 3/4" thick. But your item does not have to fulfill all conditions of the more expensive category. but be within all flat maximums; otherwise, it is a parcel. Unfortunately, when all conditions of some mail type are not fulfilled, then the item will not look typical for most of the things in that category, and users have written me to say they got into trouble. Bottom line: make it look like what it is and pay for that. Paying for a more expensive service can make the situation worse. Bad idea. If it looks like a letter, mail it with letter postage. Here's the story. You are a seller on eBay of flat guitar picks, or you are a garden club seed trader. The guitar picks or the seeds (in their own little envelope inside) are easy to mail in an ordinary envelope, any first class envelope, business size or otherwise. My personal advice is just mail it. But what if it is a little bit stiff? Maybe it's too stiff. You don't think it's over 1/4" t hick, but what if someone else does? What if someone says you can't mail merchandise in a letter? (Untrue. Companies mail free samples, you can send cash -- no compensation if lost, not a good idea, but perfectly legal.) You decide to play it safe and pay more than a letter. You pay more to send your letter as a flat. The letter with "1st class flat" postage arrives but it meets none of the conditions for a flat. The first postal clerk returns it to sender. Your second white, letter-sized envelope of guitar picks or little seed envelopes is actually lumpy enough to be a flat so you go to the post office to mail it that way. The second postal clerk refuses to sell you the higher postage for a flat because your little white envelope doesn't look like a flat. Is he right? It looks like a white letter envelope, but that is irrelevant if over 1/4" thick, as far as postal regulations are concerned. Still thinking money settles everything, the third time around you mail at the even higher parcel rate. When it arrives, the third postal clerk says your envelope meets none of the requirements for a parcel (correct!) and charges Priority Mail rates to deliver it. Moral: use white for letters, manila for flats, boxy shapes for parcels, and regulations be damned. "I am writing because the USPS has been overcharging (stealing from ) many customers who are using padded mailers that meet the Large Envelope (Flats) requirements. [JIN: over 1/4" thick so it can't be a letter, but not over 3/4" and still not too lumpy or too inflexible to run through their scanners, so it does not have to be a parcel.] It seems that about 50% (!) of them are thinking and saying, "All padded mailers must go at parcel rate. This has been an ongoing battle I have waged for several years now, but the USPS is just too big to get everyone, everywhere properly trained." "I've had several flat eBay items I've ordered make it clear to my P.O. but get kicked back to sender because of this; the seller used "First Class Parcel" but then mailed a thin, flat item <3/4" and it gets bounced back or, worse, charged postage [at the] Priority Mail rate." The eBay seller should have forced their own PO to accept the flat as a flat, but, once s/he lied (once s/he took the first tiny step away from reality) and classed it as a Small Parcel (by generously paying more), then clearly the item could not legally be a Small Parcel (too skinny, really a flat) so it must be another class of package. Priority Mail is the next logical possibility, and they went for it. The Franz Kafka Rule of Bureaucracy Management: never accept a lie, because he who once steps away from reality will never return.